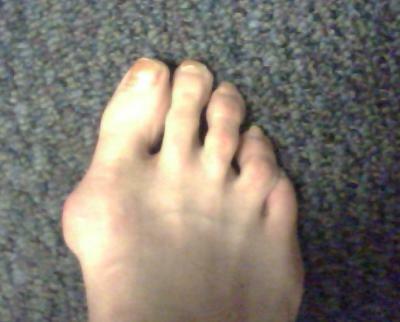 I've had a bunion on my right foot (photo attached) that first became noticeable when I was in high school (ran track and cross country but noticed bunion in pointy shoes). A podiatrist diagnosed it when I was in college. At 36, I have pretty much given up on running, have discomfort walking (but do it anyway), and take much ibuprofen for hikes with my husband, which I am unwilling to give up. (On a recent 100-mile hike over the course of a week, I took 6-8 200-mg ibuprofen/day, which may have reduced the pain somewhat but certainly did not eliminate it.) I tried orthotics about 3 years ago and in spite of wearing them for over 2 years and having them adjusted several times (at the beginning), they never provided relief from bunion pain. Maybe I gave up on the adjustments prematurely but I just didn't find relief and was a bit disgusted that something relatively pricey seemed to have so little effect. I read your bunion section amd I think I have both pain in the "bump" area as well as joint pain-- I can't use elliptical machines, for instance, because the joint pain is pretty uncomfortable after just a few minutes. I do not wear pointy shoes, I am careful about shoes I wear, but experience some pain walking in most shoes. a recovery; besides that, I just don't want to have to have surgery. A sports medicine doctor told me having bunion surgery would not necessarily achieve the desired outcome: a fixed foot that I can run on. My question is, is cortisone injection a reasonable option for a period of time, to eliminate pain and to allow increased activity level? I read that you don't recommend anti-inflammatories as long-term solutions. Makes sense. But is it foolish to consider cortisone treatment for a limited time (1-2 years)? Would it be foolish to attempt activities like running after receiving cortisone injections that reduced the bunion pain-- would such activities involving impact worsen the deformity? You are right, you cannot take ibuprofen indefinately, you are not doing yourself any service. You could try a cortisone injection; it might give you relief for a prolonged period of time but I do not think it will permanently render your bunion painless. Even though you are not anxious to have surgery and of course there is never any guarantees regarding the outcome of surgery, I think the "risk-reward" favors you and it might be an option that is worth entertaining. You are young and very active and it sounds like the bunion is putting a damper on your lifestyle. Read my essay on "Surgical consideration" and it might just change your mind. I am a 32 years old and found out last year that I have Osteoporosis. I was working a high impact job on my feet everyday, allday in steel toe shoes and experienced bi-lateral stress fractures in my second metatarsals. First my left foot then three months after returning to the same job I developed the same issue in my right foot. To say the least, I was aggravated. My doctor ordered a DEXA scan that confirmed that I had Osteoporosis. My family history, mother and grandfather both with Osteoporosis, coupled with having Crohns disease exaserbated my condition. I have another, sitting, job right now which I love. I am experiencing pain in my feet and am in the processing of discussing my options with my podiatrist. Again... I wanted to thank you for all the help and information I received from your sight. I was not suprised to find that no one else on this site had experienced the same circumstances that I had, so I thought that it might be helpful to add my comments to your sight. Since you, Dr. Mitnick, have not had any patients with Osteoporosis related foot stress fractures, I figured you might be able to use my comments in reference to future patients. I will keep you posted on what my doctor recommends for my bunion surgery. Keep up what your doing. Your a life saver. Thanks for the kind words. I am sure your podiatrist will discuss this with you, but you will be limited in the types of procedure the doctor can perform due to your osteoporosis. (BTW, I have seen this problem in my office). If the osteoporosis is severe you will not be able to have an osteotomy (surgical breaking of bone) because of the concern about the fracture site healing. Secondly, most osteotomies shorten the first metatarsal to some extent, so it puts more pressure on the second metatarsal bone, thus increasing the possibility of additional stress fractures. Make sure you ask your doctor all the right questions and thoroughly think this through before deciding on surgery. I am 27 years old, and confirmed that I had a bunion earlier this week at the doctor's office. I have been experiencing pain for about three years. I too am very active; thank goodness my sport of choice is horseback riding, which does not cause me pain. Normal activities such as walking and working the clutch on my beloved Honda civic hatchback do cause pain in the joint, however, which is a difficult thing for me to accept. I too have been considering injections for the pain, as the bunion is in its very early stages with no deformity or pain yet on the exterior of my foot. It was bittersweet to happen upon this article, as I would not wish this condition on anyone. Still, it was comforting to know that I am not alone. I thought it was very interesting that your fourth toe has a slight deformity--both of those same toes on each of my feet have the exact same bend in them. That must be a sign of poor bone structure, which we obviously have. I hope you have or will figure out a way to reduce the pain so that you can enjoy hiking and running once more. As for me, I'm trading in my Honda (tearfully) for an automatic vehicle as soon as I can find something I like. I suppose I'm going to try to look on the bright side: at least I don't suffer from a debilitating or terminal illness. God bless those who deal each day with something much worse than toe pain. Thank you so much for this feedback. I will read over the essay on surgery considerations. I've skimmed it but will take another look. If I were to opt for something like cortisone as a short term approach, not as a long-term remedy, would you anticipate that high impact activities would increase the deformity? Thank you! You know I tell my patients all the time that feet are like tires on a car; the more you use them, the quicker they wear out. So, yes, I would assume high impact activities will increase the deformity, BUT, it is important to live your life the way you want and if there is a solution to your problem (eg: surgery) you should give it the necessary thought.